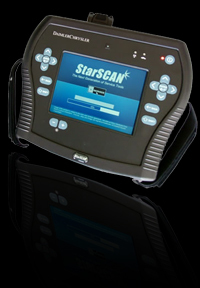 StarScan is the Chrysler/Dodge/Jeep OEM tool for all Chrysler/Dodge/Jeep vehicles that use CAN protocol. 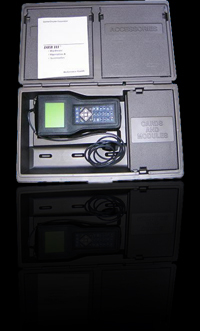 This professional grade tool is a self contained hand held device with a color touch screen. Coverage starts in model year 2004 with the Dodge Durango and continues to expand it's coverages through 2008 model year when virtually every 2008 is CAN protocol. Starscan allows access to all systems and can be used for reflashing all controllers by purchasing individual file downloads from Chryslers site as needed. Please be aware that the DRBIII is the factory tool for all non-CAN vehicles and Starscan does not replace the DRBIII for these vehicles. StarMobile is the LAPTOP based version Chrysler/Dodge/Jeep OEM tool for all Chrysler/Dodge/Jeep vehicles that use CAN protocol. The StarMobile has all the capabilities of the hand held StarScan but in a Laptop based version.The tool includes a small interface device (StarMobile) that wirelessly connects to a laptop. Coverage starts in model year 2004 with the Dodge Durango and continues to expand it's coverages through 2008 model year when virtually every 2008 is CAN protocol. StarsMobile allows access to all systems and can be used for reflashing all controllers by purchasing individual file downloads from Chryslers site as needed. Please be aware that the DRBIII is the factory tool for all non-CAN vehicles and StarMobile does not replace the DRBIII for these vehicles. DRB-III: Chrysler, Dodge and Jeep vehicles can all be scanned and re-programmed with the DRBIII package available from OEMTools.com! Package includes DRBIII, 1 year of scanner updates and reprogramming files via DVD. Model year coverages are from 2007 and can go back as far as the mid 80's on all Chrysler, Dodge and Jeep vehicles. Access is to all systems and all functions. This package will put you at a "Dealer Equivalent" level! Please note: The DRBIII will not work on CAN protocol vehicles, these newer generation vehicles require either the StarScan or StarMobile tool to service them at OEM levels.